In addition to the parts A and B of the application, part C describes the development of an information system. This part is concerned with the development of a dynamic information infrastructure. The information infrastructure encompasses the aspects information transfer between the different actors including the dynamically measuring sensors, support of the target-oriented processing of information in different forms of display and and the visualisation / transfer of information to the different users. The ‘dynamic’ aspect of this infrastructure is expressed by the possibility of including current information automatically (sensors) and new information can be provided directly by users. The transfer and processing of heterogeneous specific information and their integration in a harmonized information system is the approach part C of the project. Methods of semantic interoperability are concerned with the integration of knowledge from different application domains. In order to integrate existing, heterogeneous data sources automatically it is necessary to provide a system for the semantic interoperability of existing data sources. A methodic approach is the use of Ontologies [ Gruber, 1993 ]. Ontologies allow the mapping of classes into a hierarchical structure, the classes are linked to each other by the use of thesauri, taxonomies and relations. This concept provides a high expression strength in a formal description of technical terms. Ontologies are knowledge-based models and realize a kind of description logic for the computer. With this approach it is possible to gain logical conclusions by feature-based querries (Klien et al., 2004, Lutz et. al. 2007). With the integration of this approach in web-services, Geoinformation can be provided to an broad user group. ● for the general public, the system will provide aggregated information of latest events and personalized guidances. In one central node the citizens get localized information in their native language. ● for emergency response coordination by getting information during respectively short after a hazard for their situation. For instance to coordinate rescue teams and humanitarian aid. i. The communication is based on WebServices supporting international standards of ISO, OGC and W3C. 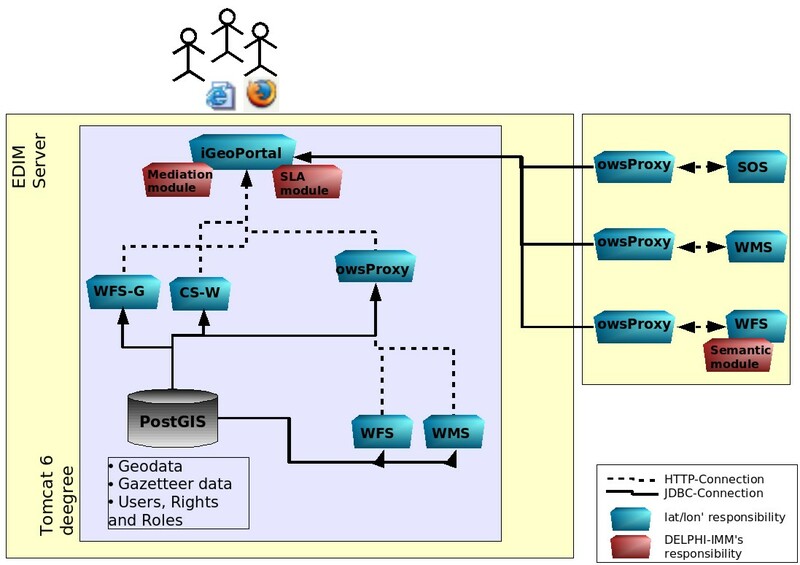 The standardized interfaces enable the interoperability of the components making the integration of information from different providers into the central portal possible: Integration of EDIM internal OGC Web Mapservices (WMS) or OGC WMSs of a local government in the portal (service-to-portal) as well as service-to-service communication between a OGC Web Feature Service and OGC WMS can be accomplished. ii. In order to support semantic aspects for the information system, the use of international standards builds a good and reusable basis. iii. The SDI concept provides a distributed network of components connected via the Internet based on the HTTP protocol. The distribution of services creates a basis for decentralization and reducing the vulnerability of the entire system. Each service is a module in the infrastructure with a different task: While sensors are collecting data like accelerations at the one end, the information are disseminated via a standardized interface of OGC sensor observation service (SOS) to the central portal for the emergency crew. A Web Feature Service (WFS) stores vector data of roads and information about current road conditions. Users that want to know if a road is blocked after a hazardous event, can log into the portal and check a map with that information rendered by a WMS. Depending on their rights they have access to more confidential information controlled by the owsPproxy component. The portal is the central information node where user's get their localized and personalized information. By using standardized interfaces, services from other networks can be hooked in transparently to the user. In between the portal and service a data processing takes place in order to aggregate data and make information of different sources semantically comparable. In EDIM a number of applikation scenarios are being developed and validated regardeing the setup of a geodata-infrastructure, for the integration of geodata and geo-services as well as for an intelligent search of geo-information application scenarios are being developed and validated. During the development of the semantic interoperability of geo data, the following services are focused on: Support of the information provider, support of the information inquirers, mediation services between information provider and information inquirers and an automatic process to perform quality control by the use of Service Level Aggrements (SLA). Concrete results of this approach are seen in a language independent risk estimation, realtime warnings, a fast disaster evaluation and support of the preparation of effective supporting measures. The following application scenarios are seen as vital regarding user requirements. Geology and earthquake catalog - this scenario describes the integration of existing geoscientific, earthquake and disaster information in a knowledge-based model. A second scenario shows the integration of land use information, infrastructure data and possibly socio-economic data stets. Relevant classification catalogue for early warning and disaster systems can be produced by ontologies and similarity measures, make determined warnings and assistance possible. A further application is to be seen in the use of Earth Observatory satellites. In this case it must be examined whether a derived classification catalogue can be applied for a guide evaluation shortly after the case of disaster. i. For the database backend PostgreSQL with the spatial extension PostGIS will be used. iii. The security components are provided out of the deegree project as well. iv. For the central information node, a portal framework (Apache Jetspeed) will be used. The clients for each OGC WebService will be realized as portlets onforming to the JSR-168 standard. Gruber, T.R., 1993: A Translation Approach to Portable Ontology Specifications, In Knowledge Akquisition Vol.5, No.2, 1993.